The semantic differences between management and leadership are primarily a result of people’s loose perceptions of what a manager and a leader are, and don’t always capture the realities of each. Managers may be viewed as more practical and focused on implementation; leaders could be seen as addressing broader concerns, such as employee experience, productivity, workplace culture, and organizational development. Rather than trying to dispel these perceptions, we should be taking a deeper look at the “differences” between management and leadership. Understanding the nuances can help leaders become better managers, help managers become better leaders, and ultimately help you determine where your strengths and weaknesses lie. Below are three key differences between leadership and management. Perhaps managers could be better described as administrators—people tasked with organizing and facilitating all the moving parts and keeping the daily grind moving smoothly. Ideally, managers/admins create an environment where employees have a framework to ensure productivity and mitigate the obstacles that can make them feel overwhelmed. Though this is obviously necessary, if not handled with care, it can lead to over-prioritizing goals and not paying enough attention to the people on the front line executing those goals. Alternatively, leadership influences team dynamics and company culture, motivates people to bring their most creative selves to work every day, and is oriented toward seeing the potential within each employee. This is also critical, but leaders must take care not to lose sight of the administrative responsibilities that still must be completed with an eagle eye. In their book Humble Leadership: The Power of Relationship, Openness, and Trust, leadership experts Edgar H. Schein and Peter A. Schein identify how “Level 1” relationships are purely transactional in nature, whereas levels 2 and 3 are rooted in something more interpersonal—the stuff great leaders are proficient at. Managers can excel in their administrative roles and still reach Level 2 relationships that empower employees. Similarly, leaders skilled at nurturing employees can also drive the day-to-day team requirements necessary to fulfill immediate and long-term goals. Managers are inexorably focused on the now. Short-term goals are ever present; anything that doesn’t contribute to the now could be viewed as a waste of time. Maintaining the status quo often wins out over any sort of risk-taking. Employees’ long-term development might be de-emphasized because, to the manager, it doesn’t solve the task at hand, which tends to take priority. Leaders bring a vision of the future—including their employees’ place in that future—to everything they do. They draw from the past, but don’t dwell on it; they acknowledge the present, but make decisions with the long term in mind. So how can we get past the status quo and move toward greater innovation? By identifying the differing kinds of trust that managers and leaders have to channel their attention toward. Self-aware leaders realize they can’t do everything on their own; they need reliable and engaged people around them to achieve group success. They also recognize the responsibility to provide the support necessary for employees to want to be engaged and achieve something beyond a middling result. Some managers, despite their belief otherwise, don’t always display this level of trust in others and can overburden themselves, therefore increasing their own workload, which inevitably leads to problems for the whole team. This can look like micromanagement, giving non-constructive criticism, a lack of empathy for employee needs, and, worse yet, greater turnover. Managing up requires maintaining open channels of communication and trust that enable people to feel they’re working as a team and toward greater goals. Along the way, managers and leaders should have check-ins in the context of their needs—whether that be setting immediate work plans or envisaging long-term career or organizational goals, people need to be on the same page. Managers and leaders alike need to nurture these open channels of communication and instill a sense of mutual trust. 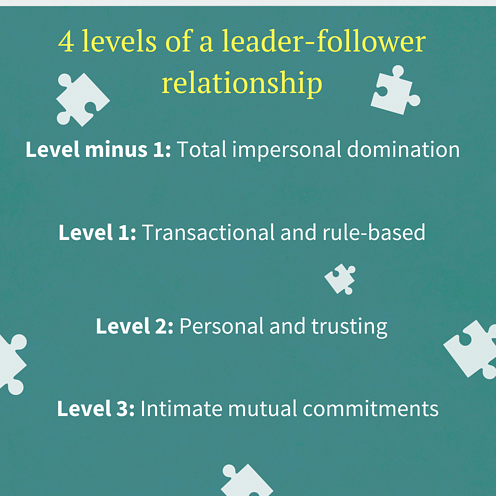 Recall the levels of relationships that the Scheins discuss in Humble Leadership—moving between levels cannot be done without these critical elements. Despite the differences in leaders’ and managers’ day-to-day tasks, without trust and communication, neither can flourish and support healthy organizational growth. Legendary radio voice Casey Kasem’s sign-off was “Keep your feet on the ground and keep reaching for the stars.” This is a perfect description of a leader who manages and a manager who leads. Mintzberg writes in Bedtime Stories for Managers, “Have you ever been managed by someone who didn’t lead? That must have been awfully discouraging. Well, how about having being led by someone who didn’t manage? That person may have been just plain disconnected: how could they know what was going on? … So let’s get past leadership dissociated from management, to recognize that these are two sides of the same job.” Recognizing what makes a great manager and what makes a great leader allows executives, supervisors, and anyone else tasked with overseeing coworkers to continually and dynamically exceed expectations.